This is the entertainment and relaxation centre of the dwelling. It is the place for casual conversation or serious discussion; the place to be enter­tained by movies or educated by books and documentaries. A plan of the dwelling's lounge is shown on the right. In the centre is a 4-metre diameter round carpet upon which is placed a 2-metre diameter low glass table. At the edge of the carpet, tan­gential to it, is a 2-metre wide television screen. 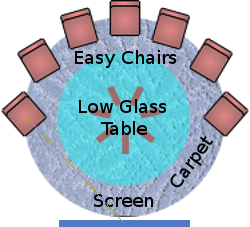 Easy chairs are arranged around the table for viewing the screen. A library, containing books and other media, occupies a 90° peripheral arc behind the chairs. A low plinth occupies a dia­metrically opposite 90° arc, upon which solid art-forms are stood for display. The wall behind the plinth is used for hanging pictures. Between each entrance pas­sage and its adjacent window is a reading desk. Thus there are two reading desks diametrically opposite each other. People today spend a lot of time viewing video programs. It is one of the main activities in most households. Our landshare dwelling must therefore include a room specifically designed for, and dedicated to, watching visual content. Our landshare dwelling is also a workplace. A workplace in a high technology age needs a room where people can sit to view an audio visual demonstration or hold a group dis­cussion. The ideal environment and equipment for recreational video viewing are essentially the same as for audio visual demonstrations for work purposes. Since the two act­ivities take place at different times of the day, the same place can be used for both. The best way to view something together as a small group is to sit in a semicircle. The screen is flat, so those in the middle of the group will get a more direct view of the screen than those at the ends. We need to make it fairer. Consider a dipole radio antenna. It radiates pow­er in a way that delivers equal signal strength to all points on a circle that touches the middle of the dipole. 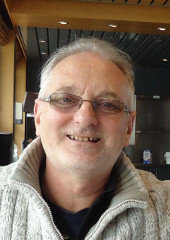 A dipole is by no means a perfect an­alogy for viewing a screen, but it is better than nothing. For each person to receive equal illum­ination from the screen, they must sit around a circle that touches the centre of the screen. An individual's view would however be too oblique if he sat anywhere on the half of the circle closest to the screen. Everybody must therefore sit on the semicircle furthest from the screen, as illust­rated on the left. Each chair is a comfortable well upholstered easy chair in leather or soft fabric. The centre point of each seat rests on the semicircle. The chairs swivel easily to enable people to sit with equal comfort while facing either the screen for viewing or the centre of the group for discussing. 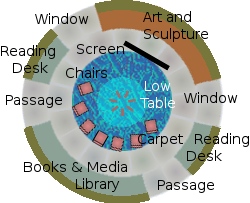 Centred within the 4-metre diameter carpeted circle is a low round glass table 2 metres diameter and 46 centimetres high. At the far edge of the round carpet is the screen. This is essentially a very large tablet computer with internal mass storage for audio, video and documentary content. It is controlled via a standard keyboard and mouse on the low glass table, which are linked to the screen via Bluetooth-type radio. The screen receives content via the dwelling's local area network. 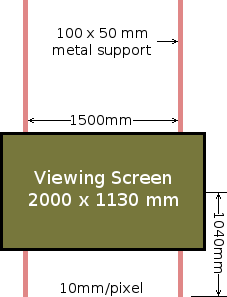 The best size for a high definition screen for view­ing by a group of up to 8 people is between 1½ and 2 metres wide with an aspect ratio of 16:9. The screen is mounted on 100 millimetre metal box rails, which run from floor to ceiling. The hei­ght of the screen is adjusted so that the middle of the screen is 1040 millimetres above the floor, the ideal viewing height from an easy chair. The sound system comprises 4 speakers plus a sub woofer. A right and left speaker is mounted in the ceiling above each side of the screen. Two more speakers are mounted one in each end of the peri­pheral library arc behind the chairs. The sub woof­er is mounted in the floor underneath the table. The library and the media viewing facilities are both in the lounge area. It is therefore possible, at times, that sound from the viewing equipment could seriously disturb people who are reading. 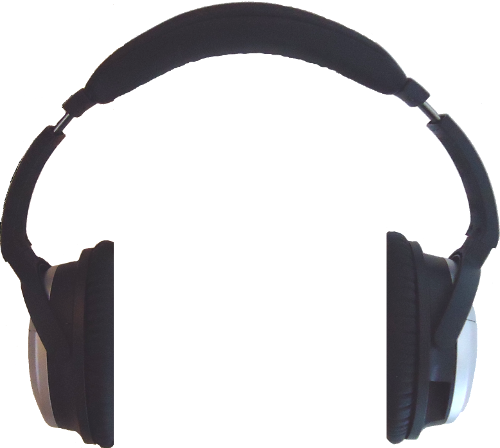 At such times, anybody using the video facilities can turn off the universal sound system and use headphones. These should be cordless, using Bluetooth-type technology to receive the media sound via short-range radio broadcast. Dimmable shielded coloured strip LEDs are mounted in recessed grooves around the edge of the screen enclosure to provide background lighting for viewing. The library's storage facility is a curved bookcase forming a 90° arc around the loung's outer wall. This has dust-proof doors, which are kept closed except when a book or data storage object is being sought or retrieved. Its design and appearance is similar to the wardrobe units in the bedroom and entrance hall, as illustrated below. The bookcase contains books, electronic tablets and other information storage media. It also houses a computer equipped with media drives and readers, including as many legacy devices as can be obtained. This is to facilitate the liberation of historic data which is trapped on obsolete forms of recording and storage media for which drives, readers or players are no longer generally available. Readers sit to consult books and other media at the two diametrically opposite reading tables, where the adjacent windows provide good natural light. A large part of the library's content is on the library's computer. This may be read, via the libr­ary's wireless network, on mounted tablets located at the reading tables. A low plinth, covering the same floor area as the bookcase, occu­pies a diametrically opposite 90° arc around the lounge's wall behind the viewing screen. This is used for accommodating house­hold sculptures and ornaments. The curved wall behind is given a rustic appearence and is used for hanging pictures and other forms of wall art. An arc of down-lights plus individual spot-lights illuminate the contents of the plinth and the wall. Below the lounge is a small gynasium. This is accessible only from the central garden via an outside door at ground-level. The gym­nasium contains a treadmill and exercise weights.